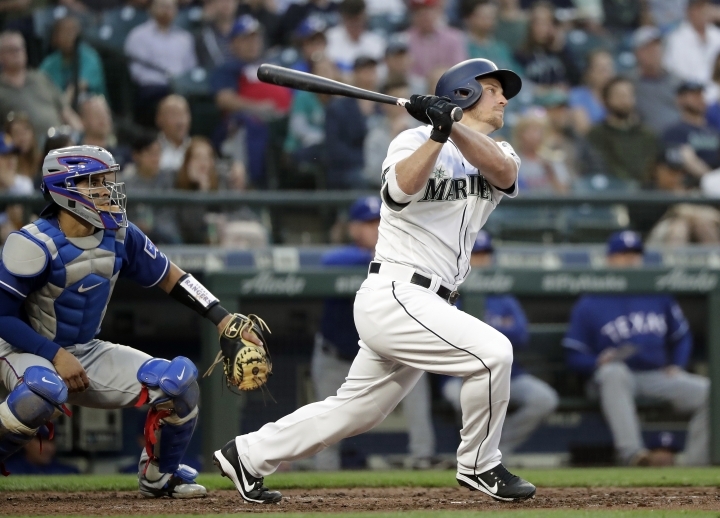 SEATTLE — Hours after losing their All-Star second baseman to a drug suspension, the Seattle Mariners ended the day on a positive note with a win in extra innings. 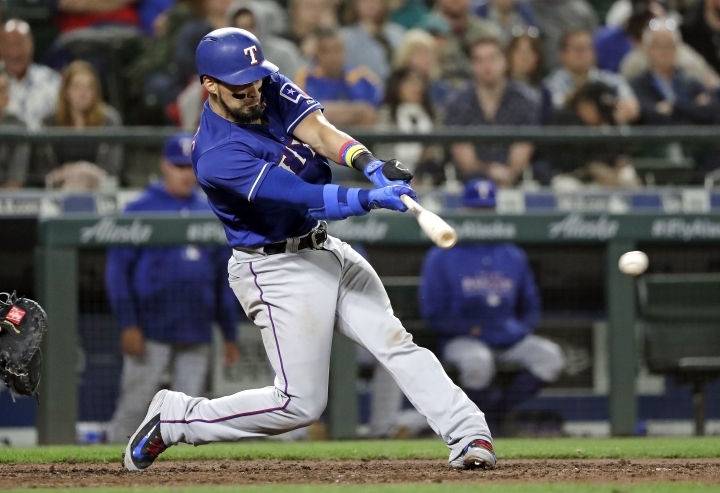 Guillermo Heredia's single to left-center drove in Ryon Healy from second base in the 11th inning to lift the Mariners to a 9-8 victory over the Texas Rangers on Tuesday night. Healy reached on a bloop single to right field off Texas reliever Alex Claudio (1-1) and advanced to second with David Freitas reached on an infield single deep in the hole at shortstop. Earlier in the day, Robinson Cano was suspended 80 games for violating MLB's drug policy. 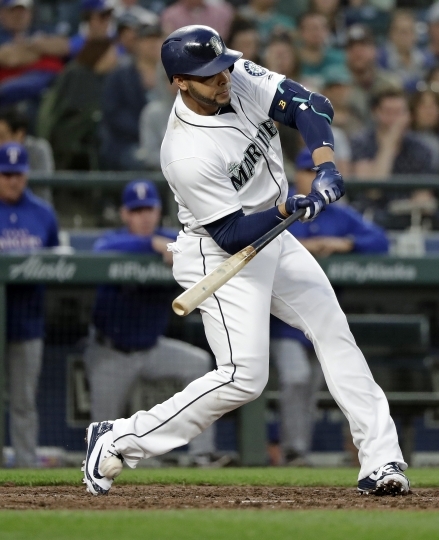 Cano, who was already sidelined at least a month by a fractured right hand, suffered when he was hit by a pitch Sunday, was set to serve the suspension immediately. 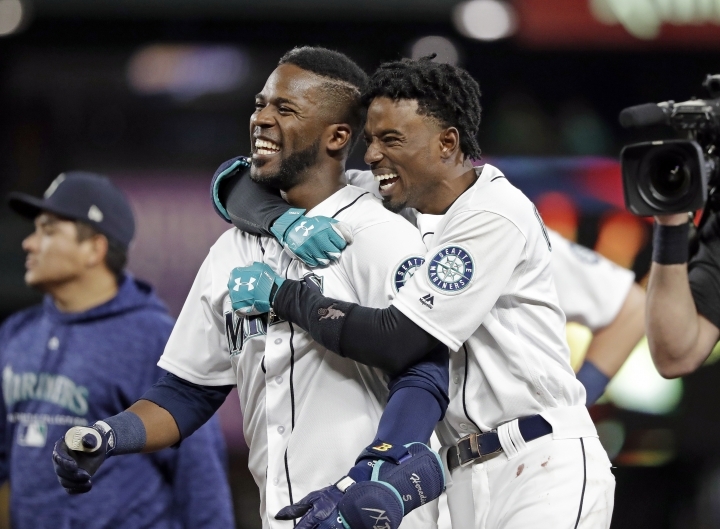 "Our guys were down in the clubhouse today," Mariners manager Scott Servais said. "And with Jean (Segura) being so close to Robbie, he was frustrated by it. But the best way to take out your frustration is out on the field, and on the other team." 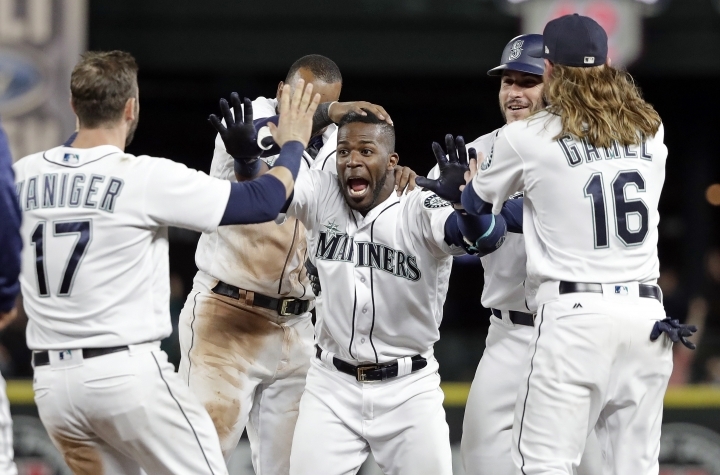 It was Seattle's 10th come-from-behind victory this season, which is tied with Houston for fourth-most in the American League behind Boston (14), Toronto (13) and New York (11). "Despite all the sadness around here, guys were able to pull it together," Heredia said. Segura reached base four times, including three singles, and stole four bases, which matched the single-game club record. The last Mariners player to do that was Ichiro Suzuki against Texas in 2010. And Segura's RBI single off Texas reliever Jose Leclerc into left field gave the Mariners an 8-7 lead in the eighth inning. Texas tied it in the ninth against AL-leading closer Edwin Diaz, who blew just his second save opportunity this season. 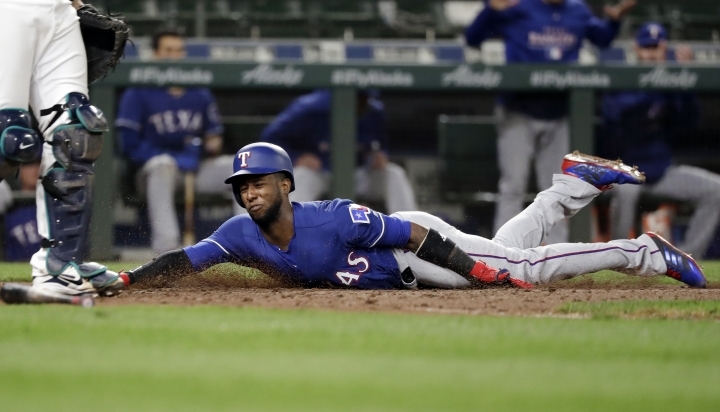 With one out, Joey Gallo hit a hard grounder right at Healy, who fumbled it for a second before tossing over to Diaz, who outraced the Rangers' slugger to first base. Seeing Diaz and Gallo run into each other just past the bag, Jurickson Profar raced home without a throw to tie the score at 8-all. Servais immediately claimed that Gallo interfered with Diaz's ability to throw home, and argued the non-call. He was eventually ejected for the first time this season by first-base umpire Jeff Nelson after a heated exchange. 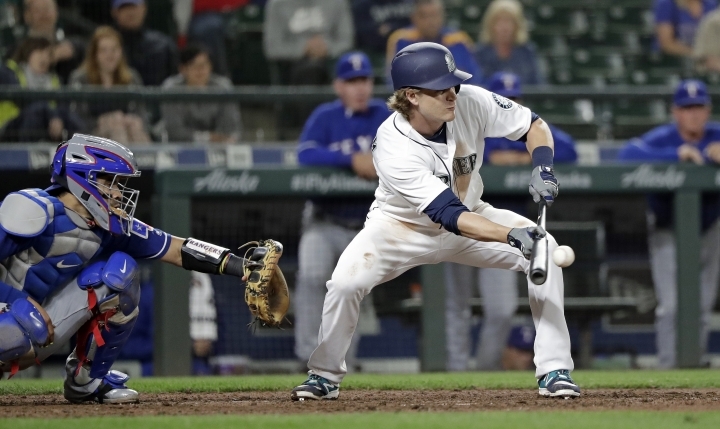 The Mariners snapped the Rangers' three-game winning streak at Safeco Field. "This was a game that we were down early and fought back, showed character," Texas manager Jeff Banister said. 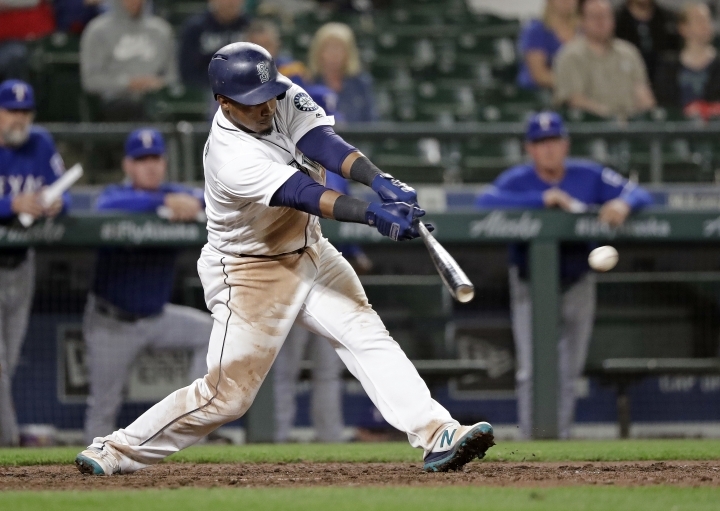 Mariners slugger Nelson Cruz left the game in the fourth inning after he was hit by a pitch from Brandon Mann on top of his right foot. He limped to the dugout with the help of two staff members. Results of X-rays were negative. Servais said Cruz has a deep bone bruise, and will miss a game or two. Mann was back in his hometown two days after become the second-oldest Rangers player to make his major league debut at 33. "I was a diehard Mariners fan," Mann said. "A few different seasons, my dad took us to 50-70 games." Mann said outfielder Ken Griffey Jr. was his first childhood idol. Then it became Ichiro. In 2002, he was drafted by the Tampa Bay Devil Rays, and spent the past 17 seasons in the minor leagues, independent leagues and pitching in Japan. Mann got the final five outs for Texas in a 6-1 loss at Houston on Sunday in his big-league debut. Yoshinori Tateyama was 35 when he made his debut with Texas in 2011. 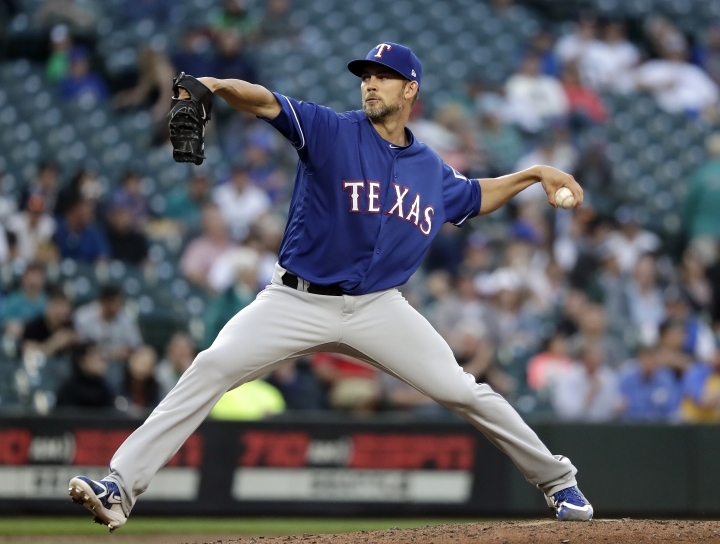 Mann, who turns 34 on Wednesday, came on in relief of starting pitcher Mike Minor against the Mariners on Tuesday and wiggled out of a fourth-inning jam, then pitched a scoreless fifth. Rangers: 3B Adrian Beltre (left hamstring) was placed on the 10-day DL on with a Grade I strain. No official recovery timetable was given. ... LHP Martin Perez (elbow) is still in rehab to reduce the inflammation in his elbow, manager Jeff Banister said. There is no timetable for his return. Rangers: RHP Bartolo Colon (1-1, 3.32 ERA) is on six days of rest after taking a no-decision in Texas' 5-4 victory against Detroit on Wednesday. He currently has a five-game winning streak against the Mariners, but took a no-decision in Seattle's 9-7 win on April 21 in Arlington. Mariners: RHP Christian Bergman (3-3, 3.40 ERA for Triple-A Tacoma) will be added to the team's 40-man roster, and make his first big-league appearance with Seattle since Aug. 30. Last season, he went 4-5 with a 5.00 ERA in his 13 appearances for the Mariners.